Paul Hilder – Avaaz.org – informs us of the success in getting people to answer the call to the UN to be serious about saving elephants. There should not be any exceptions for Tanzania and Zambia. We want to add that Canada should not get exceptions for seals, neither Japan for whales. In short – the UN should not cave in to anyone when the issue is the conservation of world heritage. Elephants or Ivory — Amazing response! Wow — the petition to protect endangered elephants from ivory poachers is exploding — in just over 72 hours, more than 300,000 of us have signed the call to the UN to uphold the ban on ivory trading and save whole populations of these magnificent animals. The crucial UN vote is expected this week. Tanzania and Zambia are lobbying the UN for special exemptions from the ban, but this would send a clear signal to the ivory crime syndicates that international protection is weakening and it’s open-season on elephants. Another group of African states have countered by calling to extend the trade ban for 20 years. Over 20 years ago, the Convention on International Trade in Endangered Species (CITES) passed a worldwide ban on ivory trading. Poaching fell, and ivory prices slumped. But poor enforcement coupled with ‘experimental one-off sales’, like the one Tanzania and Zambia are seeking, drove poaching up and turned illegal trade into a lucrative business — poachers can launder their illegal ivory with the legal stockpiles. Across the world’s cultures and throughout our history elephants have been revered in religions and have captured our imagination — Babar, Dumbo, Ganesh, Airavata, Erawan. But today these beautiful and highly intelligent creatures are being annihilated. Our idea – if Tanzania and Zambia get their way it would be right to start a campaign to boycott tourism to these countries. Did anyone think that Canada and Japan might also be helped to changing behavior by similar means when traditional killing of seals and whales is what they do? The US has said that it will prosecute and penalize a sushi restaurant that served whale-meat, so invoking penalties might work. If nothing else it will make us feel good for having reacted to someone’s lack of honesty. Video contest on DEMOCRACY shows winners from Brazil, Nepal, Philippines, Poland, UAE, Zambia. Another Mugabe Casualty – Zambian President, Levy Mwanawasa, Dies in a French Hospital After Getting a Stroke Under The Pressure For Trying To Lead A Reluctant Africa Away From the Mugabe Precipice. The Passing Away of One of the Few Africans In Power Mid-2008 Who Had A Horizon Wider Then The Width of Their Chair. Africa mourns loss of a leader unafraid to speak his mind. One Sunday in late June, Levy Mwanawasa, the Zambian president who died yesterday aged 59, was on the eve of the most momentous day of his career. He had been the first to break the longstanding deference of African rulers towards Robert Mugabe, condemning the abuses that had culminated in the Zimbabwean autocrat claiming victory in a discredited election. As early as March last year, Mwanawasa had referred to the “sinking Ti-tanic” that was Zimbabwe’s inflation-battered economy. Now, as the serving chair of the southern African bloc, the retiring former lawyer would carry the hopes of many Zimbabweans into an African Union summit in Egypt at which Mr Mugabe would try to stare down his counterparts into legitimising his flawed triumph. For a man most at ease in small gatherings, assiduously reading his briefing papers or escaping to the family farm for the planting season, the ordeal ahead was immense. Alphabetical seating by country was to have put him next to Mr Mugabe. It proved too much. Always in poor health since the car crash 17 years earlier that left him with slurred speech, Mwanawasa suffered a stroke. Even as he was flown to the Paris hospital where he would die seven weeks later, the summit was welcoming Mr Mugabe back to the fold, thwarting the efforts of a handful of Mwanawasa’s like-minded peers. The second son of 10 siblings, Mwanawasa was born in Mufulira, near the Congolese border, in 1948, 16 years before Zambia’s independence from Britain. A crusading legal career established his public profile. When the one-party state of Kenneth Kaunda unravelled into elections in 1991, Frederick Chiluba, the victorious leader of the Movement for Multiparty Democracy, appointed Mwanawasa as vice-president. In 2001, disillusioned with the pervasive corruption of the Chiluba regime, Mwanawasa turned on – and ousted – his mentor. Within weeks he had stripped his predecessor of immunity from prosecution. A London court later found that Mr Chiluba had salted away $46m (â‚¬31m, £25m) of public funds. Mwanawasa’s anti-graft offensive won him the allegiance of international donors who flooded state coffers with aid. 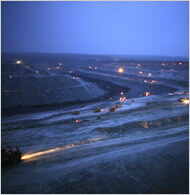 China came calling too, tempted by some of the world’s richest copper deposits. Economic growth rose from just over 3 per cent a year when he took office to 6 per cent last year. It is not clear who will take up that challenge. Mwanawasa avoided anointing an heir. His death has thrown his party into turmoil as cabinet ministers who thought they had three more years to jockey for position face an election within three months. The discord may open a window for Michael Sata, the opposition leader who came second when Mwanawasa won a second term in 2006 and who has lambasted the government’s fiscal orthodoxy. Those who knew Mwanawasa, who had six children with his wife Maureen and two from a previous marriage, describe a man whose unspectacular oratory masked a deep conviction. A Zambian Lady-Farmer Comes to Hokkaido’s G8 To Speak For Africa’s Farmers. The Issue is Sustainable Farming For Small Scale Farmers – there is no organized system for such endeavors. The Two Zambians Want Sustainability Based On Local Crops – Not Outsiders That Make Suggestions That Do Not Work In Africa’s Conditions. G8 COUNTDOWN: G8 blind to Africa’s true needs, farmer says. Zambian farmer Joyce Mwanje landed in Japan after a long journey across half the globe, leaving her husband and seven children to tend to the fields where they till the land with hand hoes to grow maize, soybeans, vegetables and other crops. Mwanje has come with the important mission of representing fellow African peasant farmers to make their voices heard by the leaders of the Group of Eight countries who will meet in Hokkaido from Monday for their annual summit. Mwanje, 47, who heads her community’s farmers development club in the rural area of Chibobo in Serenje, central Zambia, wants to ensure that the G8 nations not only live up to their aid pledges, but also realize Africa’s true needs. “The problem we have is we can only use hand hoes for plowing our land. We don’t manage to have much harvest for income,” she said. Joseph Ssuuna, secretary general of nongovernmental organization PELUM Association, accompanied Mwanje to Japan. He said aid provision is complex and flawed. “When world leaders meet to talk about the food crisis in the world, they have to look at the means of production that people have at their disposal,” he said. Ssuuna, whose group promotes ecological land-use management, criticized the developed nations’ emphasis on introducing new seeds and increasing the amount of fertilizers and agrochemicals in their push for the so-called Green Revolution for Africa. He said that what is really needed to transform the lives of African farmers is access to basic farming machinery and micro-financing. In Mwanje’s village, where the size of the average family is eight people and agriculture has been the source of livelihood for generations, a Zambian NGO called the Green Living Movement has been promoting sustainable agriculture since 2000. Mwanje said she and other farmers have adopted the practice of agroforestry, in which nitrogen fixing tree legumes are planted in their fields for soil fertility instead of using synthetic fertilizers. The method has helped improve her productivity and her income base, she said. Even so, efficiency is relatively low due to a lack of basic farming machinery, electricity and irrigation — she still has to draw water from a well and waters the crops with a jerrycan, and pound harvests of maize and soybeans manually with sticks. Each year, she harvests about 25 to 30 bags of maize, the main crop for income, at 50 kg each. Most is consumed by her family with only an average of five bags left for sale, and each bag fetches 34,000 Zambian kwachas, or approximately $10. Ssuuna explained that although the recent surge in global food prices should in theory be an opportunity for African farmers, in places like Zambia, where crop prices are set by the Food Reserve Agency and rural farmers have poor access to open markets, the price hikes only profit the agency and middlemen traders while farmers get paid little for their produce. Japan, to show its leadership as this year’s G8 chair, has pledged to double aid to Africa by 2012 and help double rice production on the continent as part of medium- to long-term assistance in tackling the food security issue. But both Mwanje and Ssuuna expressed doubt about promoting rice in Africa. “I once tried to grow rice in our field, but the harvest was not good and we didn’t get any rice grains to eat. May be water was not enough,” Mwanje said. She added that while she tried for one season because she liked rice, she never went back to growing it again. Ssuuna noted that while consumption of rice in Africa has risen in recent years, it was partly because rice producers like Japan and other Asian countries have offloaded their large surpluses in Africa. In some cases, the dependence on rice imports have triggered food riots, such as in Sierra Leone, amid the price surges. “What do we learn from that? If you disrupt people’s production systems and you make them dependent on other production systems for their food, you are creating a catastrophe,” he said. “I think a more sustainable support system should focus on African indigenous crops that have already been localized and are suitable to the ecosystem in these places,” Ssuuna added. Mwanje and Ssuuna, with the support of Japanese NGOs, will be in Hokkaido to meet Japanese and international press when the three-day G8 summit begins Monday at the Lake Toya resort. UPDATED – SEEMS TO BE ANOTHER SELF-INFLICTED HIT-IN-THE-EYE – So What If Ban Ki-moon Blesses Over SADC Sponsored Lusaka Regional Summit April 13, 2008 To Deal With Zimbabwe’s Internal Politics. WILL NOW BAN KI-MOON TAKE A REAL POSITION ON SOUTH AFRICA? Just Got In: Mugabe Skips Regional Summit on Zimbabwe. LUSAKA, Zambia (AP) — Southern African leaders discussed Zimbabwe’s deepening electoral crisis in a marathon summit that ended before dawn Sunday with a weak declaration that failed to criticize the absent President Robert Mugabe. Opposition leader Morgan Tsvangirai, who claims to have won the March 29 election outright, had wanted the leaders to press Mugabe to resign after 28 years as Zimbabwe’s leader. Western powers, the United Nations and regional church, democracy and human rights groups had called for the meeting to demand an immediate announcement of the long-delayed election results. Independent tallies indicate Mugabe lost the election, but garnered enough votes to force a runoff. The summit promised to send observers if there were a second round of elections. The team it sent in March was led by a junior minister from Angola, a country that has not held elections since 1992. Zambian President Levy Mwanawasa had called the emergency summit with 48 hours’ notice. Afterward, his foreign affairs minister told reporters there was no crisis in Zimbabwe, echoing statements made by South African President Thabo Mbeki. Mbeki said Saturday there was ”no crisis” after he had to fly to Zimbabwe before Saturday’s summit to engage Mugabe, who reportedly was not taking calls from African leaders last week. Mbeki’s policy of ”quiet diplomacy” on Zimbabwe has been likened to appeasement that allows Mugabe to continue his autocratic rule unimpeded. The Southern African Development Community that held the summit has been accused of pandering to Mugabe with disregard for its own constitution to promote democracy. Tendai Biti, the secretary-general of Zimbabwe’s opposition Movement for Democratic Party, denied that was what it said. Tsvangirai had hurriedly left the summit four hours before it closed and did not return as promised. Biti repeated charges that Mugabe has orchestrated a campaign of violence to intimidate opponents who voted against him, with allegations of beatings and burnings of huts corroborated by local and international human rights groups. Pande said the rival parties had agreed at the summit that the elections were free and fair. ”The very fact that they had the guts to actually hold this extraordinary summit acknowledges that things are not right in Zimbabwe,” Biti added. Inviting Tsvangirai to the meeting was an unprecedented move that probably accounted for Mugabe’s absence. The Zimbabwe Electoral Commission said it would conduct a full recount of the presidential and parliamentary vote on April 19, the state-run Sunday Mail newspaper reported. Commission chairman George Chiweshe said candidates, party representatives and observers would be allowed to witness the process, the paper said. Mugabe’s party had demanded a recount, even without results of presidential elections announced. Pande said the summit could not demand election results while Zimbabwe’s High Court is considering opposition application asking a judge to order the immediate publication of results. The court, stacked with judges loyal to Mugabe, has dallied more than a week over the urgent appeal. There was no comment from Mugabe or the three hard-line ministers he sent to represent him at the summit. Mugabe’s allies indicated Saturday’s summit was part of a Western plot to overthrow him because of his land reform program, which was touted as an effort to redistribute the wide swathes of fertile land owned by the tiny white community to poor blacks. Instead, farms went to Mugabe’s relatives, friends and cronies and the economy of the former food exporter collapsed. ”This time, African leaders are supposed to do the bidding of the white West, that is to pressure Zimbabwe to abet regime change agenda,” said a column in the state-run Herald newspaper Saturday. With Mugabe on the defensive after the election, ruling party officials have encouraged militants to invade the country’s few remaining white-owned farms and some farms owned by black opponents, saying they were trying to protect Zimbabweans from encroaching colonialism. Opposition officials say such attacks are a smoke screen for assaults on mainly black opposition supporters. The summit was seen as a major test for the Southern African Development Community. ”The very integrity and utility of the SADC is at stake,” said New York-based Freedom House, which charts democracy’s progress around the world. An estimated one-third of Zimbabwe’s population has fled the country as it descended into political and economic chaos. ”If SADC cannot even get a state to release their election results, it’s going to be very difficult for SADC,” she said. The release of Zimbabwe’s election results ceased after results from legislative races held the same day as the presidential vote showed Mugabe’s party lost control of parliament for the first time. Associated Press writers Joseph J. Schatz in Lusaka, Zambia, and Angus Shaw in Harare, Zimbabwe, contributed to this report. BAN KI-MOON WELCOMES ANNOUNCEMENT OF AFRICAN SUMMIT ON ZIMBABWE says the UN official UN News. Through a statement issued by his spokesperson, Mr. Ban congratulated the leaders of the Southern African Development Community (SADC) for arranging a summit of heads of State in Lusaka, Zambia, on 13 April to discuss the situation. “The situation in Zimbabwe could deteriorate if there is no prompt action to resolve this impasse,” he added in today’s statement. In the presidential poll, the incumbent, Robert Mugabe, is facing Morgan Tsvangirai and Simba Makoni. If a winning candidate does not win more than 50 per cent of the total votes, a run-off race is required. Mr Tsvangirai’s party, the Movement for Democratic Change, petitioned Zimbabwe’s High Court to demand the release of the election results. The electoral authorities have already announced the results of the Senate and parliamentary elections, which were held on the same day as the presidential vote. It seems that even in the tightly controlled Zimbabwe, the elections were won by Tsvangirai. Mugabe, who has outlived a long time ago his usefulness to his people, does not accept the end to his rule and called for new elections which he will now control better. Tsvangirai, in full right, does not want to go for new elections. Will now South Africa finally realize that the region has had enough of Zimbabwe? Previously South Africa chose to stab in the back all of Africa by supporting Mugabe’s Zimbabwe in its quest to chair the UN CSD and now can only blame themselves for having turned to shambles that UN outstretch to Africa. Mugabe, who is Zimbabwe’s ruling President since Independence, has turned a country that was the bread-basket of its region to a perpetual needy country living now on food imported from Zambia. This must change if there is to be hope for Southern Africa. Sunday August 26, 2007, The New York Times Points At China’s Environmental Crisis Caused By Its Choking On Growth, But Has No Word About The Upcomming Efforts Of The UNFCCC, This Week In Vienna. Watching over the US from Vienna, we found that the Sunday before the opening of the meeting in Vienna that is bound to help the re-entry of the US into the climate negotiations process, The New York Times does not mention a word about the Vienna Workshop. Instead, the NYT is loaded with references to China’s transgressions, which to be honest, are very little more then China’s misguided effort at copying what the US was doing for years. Now, does the New York Times believe that the US should be given monopoly rights for humanities efforts at communal suicide? Will the NYT dispatch to Vienna its only reporter who truly understands the issues, its scientific reporter, Andrew Revkin? Will they commission their best columnist, Thomas Friedman, to analyze the outcome from this week-long meeting? This Week in Vienna will have to prepare material for the September 2007 meeting at the UN General Assembly High Level Section in New York, that together with any outcome from the September meeting called by the Bush Administration, will be the two events to prepare “marching orders” to the country-delegations that meet in Baly – December 2007 – literally the last chance to start negotiations for the elusive post-2012 CO2 emissions’ regime. 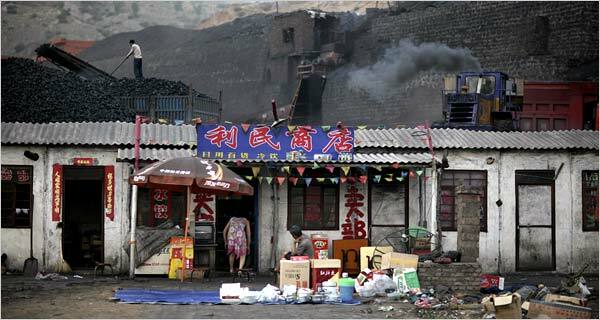 “China is making decisions today that will affect its energy use for next 30 or 40 years. Unfortunately, in some parts of the government the thinking is much more shortsighted.” This from Noureddine Berrah, an Energy Expert at the World Bank. The NYT website contains a world -multimedia section that shows graphically China’s Pollution transgressions – “China’s Epic Environmental Crisis. The NYT feels that as China “Roars” pollution reaches deadly extremes which is clearly true as it was true when the US had its industrialization binge, or when Austria started out before the formation of environmentalism. Oh! Yes! first environmentalism was about saving rainforests and elephants – right out there for “our” enjoyment at vacation time – the effort of the 1950s of the Naturamico friends, but things changed and the Austrian people voted to close an already built nuclear plant – yes – by then they understood that the environment, and thus our lives, are endangered by letting lose, from its safe bottle, the “development genie.” Unchecked Growth is unsafe – in Austria, in the US, and now in China. The New York Times might feel safe from the rage of some the US corporations – its advertisers that provide the NYT company profits – when they point a finger at China – the folks that sold lead containing toys to US children, and other poison containing tooth-paste material to the high profit US drugstore chains. What www.SustainabiliTank.info is waiting for are the New York Times articles that analyze the US stand in Vienna, the articles that show the NYT understands the place of OLD POLLUTION when we try to talk sense to the NEW POLLUTERS. This is the essence of the Vienna workshop – not the fight against the new polluters – but the working out of some sort of arrangement with them in the name of MOTHER EARTH – a corny concept but the only concept to go by – as it was clear to what we gloatingly call the primitive societies who still know a thing or two about PACHA MAMA. President Hu Jintao‘s most ambitious attempt to change the culture of fast-growth collapsed this year. The project, known as “Green G.D.P.,” was an effort to create an environmental yardstick for evaluating the performance of every official in China. It recalculated gross domestic product, or G.D.P., to reflect the cost of pollution. SustainabiliTank: The US, the former prime country when it came to investments overseas, has now to watch how China has learned to do similar things that in the end, like the investments from the US, end up causing UNSUSTAINABLE DEVELOPMENT. As an example we pick the New York Times well documented case of China-in-Zambia. China has plans to invest hundreds of millions of dollars in Zambia and will become an important economic partner of Zambia. China will develop and lift the production of primary materials in Zambia, and export to Zambia cheap ready made products – now some in Zambia will hail this as a resulting increase in the standard of living. The Zambians will grow the cotton and will be able to buy cheap jeans. Really – no different from what the British did in the old days in Sudan or India. The New York Times writes: “China’s investment in Africa comes with a price” and shows us a set of 10 photos taken in Kabwe, Zambia. We see factories that once processed traditional-patterned cloth that have been shut down as more affordable goods have flooded the market. The Mulugushi Textile Factory was set up to provide local jobs in Kabwe, but now it is closed. 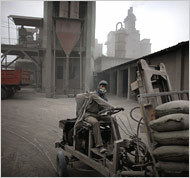 Some of the people have found jobs in providing the commodities for export to China. We wonder if this is really what the NYT found here to criticize – but we feel compelled to think about the search and lifting of oil and minerals. We have difficulty here seeing what the Chinese are doing in Zambia more shocking then what the Americans and the British have done in Nigeria. Further – the Sunday New York Times takes us to the Beijing Olympics. One could actually think that the Olympics’ Committee has voted to hold the 2008 games in Beijing, in full knowledge of the miserable air quality of a city situated in between the sand storms coming from the desert, and the carbon particles spewed out from power plants, motor vehicles, and just any use of coal as an energy carrier. The air in Beijing, because of the proximity to the desert, like the air in Ber Sheba, Israel, was bad, on some days, even before the introduction of modern industrialization. Would it be sacrilegious to say that putting the Olympics in Beijing was for the purpose of having an international handle over China? Smog and traffic returned to Beijing after a four-day experiment to reduce congestion. The marathoner Deena Kastor said she was confident that China would control pollution. They staggered and collapsed. They were taken away on stretchers, soaked in sweat that had no chance of cooling them. Others simply stopped running, as their bodies failed to cope with the weather. Of the 85 runners who started, about a third failed to finish behind Luke Kibet of Kenya, who won in 2 hours 15 minutes 59 seconds. "For me, it was the hardest race of my life because the condition is no good," said JosÃ© Manuel MartÃ­nez of Spain, the 10th-place finisher, standing a few feet from where another competitor toppled over without warning. "I hope the Olympics will be better. If Beijing is going to be anything like this, I don't know what we will do." At next year's Olympics in Beijing, if pollution levels in that city are not abated to limits acceptable for the athletes, experts say, conditions for the marathon and other endurance events will be much worse than they were here Saturday. In a visit to China this month, Jacques Rogge, the president of the International Olympic Committee, said some Beijing Olympic events might be postponed if the pollution would put the athletes at risk. Although Rogge was not panicking over the environmental issue, saying last week that he was "very confident" China would clean up Beijing, his suggestion to juggle the dates and the locations caused a stir. Some athletes and coaches said that moving those events, particularly at the last minute, could be a disaster. "The Olympics should have a fixed time and place because the athletes and coaches train very specifically for the day and the course," said Yilma Berta, Ethiopia's national marathon coach. "If the race is changed, then we may travel to the site too early, and then we are not having the proper training for the days before the race. It would be a very, very big problem for us." Some sports federations, like those of the United States, Australia and Britain, have decided to house some of their athletes away from Beijing until right before the competitions so they will not be exposed to poor air. That strategy has been used before. 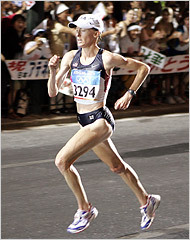 For the 2004 Games, Deena Kastor stayed on the island of Crete with the United States team until two days before the Olympic marathon because of pollution concerns in Athens. It made all the difference, she said, because an athlete is so sensitive to change that even the smallest amount of pollutants has the potential to affect breathing. "It's strange that we can be such powerful athletes, but be so fragile at the same time," said Kastor, who won a bronze medal in 2004. "I think we are, in every sense of the word, fine-tuned. We know if our food is too salty. We know if our bed is too stiff. We know if the turns of a track are too tight because it might lead to us pulling a tendon in our ankle. If it's something as big as pollution, I think that would definitely affect us pretty drastically." When Kastor runs in air that is less than clean, she said, she immediately feels it. Her chest tightens, resulting in an inability to breathe deeply enough to get oxygen to her muscles. She also blows her nose often, as if she had a bad head cold. Although she said she was convinced that Beijing will be ready for the Games, Kastor was still planning to take precautions against any possible pollution. She said she would travel to the event from an outside location, and even wear a surgical mask around town, if necessary. "I could get one that matched my uniform," she joked. The air quality in Beijing poses a triple risk to endurance athletes like marathoners, cyclists and triathletes who spend a prolonged time outdoors. In addition to the high heat and humidity that plagued the marathon in Osaka on Saturday, particulates, sulfur dioxide and carbon monoxide in the air can trigger exercise-induced asthma attacks in athletes who never had them. It is also possible that athletes could have allergic reactions to specific pollutants, causing their air passages to become irritated and constricted. But treating asthma or allergies can be a problem at the Olympics because some medications contain banned substances. To use inhalers legally, athletes must be evaluated by medical experts to document that they have asthma, said Dr. Juan Manuel Alonso, the head of the International Association of Athletics Federations' medical and antidoping committee. "Those tests usually take some time, so if the situation happened all of a sudden in Beijing, it would be difficult to evaluate whether they really have exercise-induced asthma," Alonso said. "At the site, we would have to be prepared to test anyone at any time. It may be possible to obtain a temporary exemption, in an emergency." Alonso said the track federation would receive a report in one or two months from the Beijing Olympic organizing committee with details on the city's pollution problem. Outside professionals will be called in to determine if the air-quality standards are good enough, he said. That report will use data from this month, when city officials experimented with traffic restrictions, which kept about one million cars off the road each day but still left a haze over Beijing. "In my opinion as a medical doctor, the sports authorities have to be more sensitive to the medical issues of athletes when they evaluate a location for the Olympics or world championships," Alonso said. "It's not a second priority. They should ask for medical opinions before they choose anything." But now that it is too late, some sports federations are trying to figure out ways to overcome the air quality problem. David Martin, an exercise physiologist with USA Track and Field, said he and Randy Wilber, an exercise physiologist with the United States Olympic Committee, tested the use of face masks during practices at the world junior track and field championships last year in Beijing. Ideally, the masks would filter out harmful air particles, yet still allow the athletes to perform at maximum speed. They did not work as hoped, Martin said. Although the masks kept out particles like soot, they failed to allow the athletes to breathe naturally. But the research continues in an effort to find a mask that will be effective. "Even if you have a healthy set of lungs," said Martin, who specializes in research on the marathon, "you still might be sensitive to foreign substances in the air, so we are trying to cope with a very serious issue." He added: "The better choice right now is to just eliminate the pollution. I think the Chinese will do that because they have to do that. It would be embarrassing if they had a massive boycott because the athletes did not want to compete in those conditions. It would be embarrassing if they had dozens of athletes having asthma attacks or competing with face masks. China just doesn't want that as their legacy."